Gas bottles under flood conditions can become a hazard if not secured in some way. A 47kg gas bottle even when full will float but when empty the force needed to submerge the bottle or even secure it is tremendous. 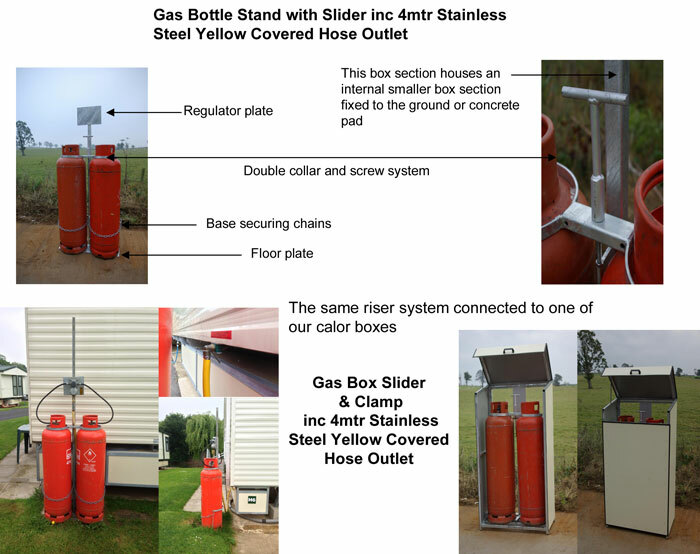 Because the gas bottles stand at ground level and the flotation unit on a Caravan stands approximately 20” higher, the flood waters will float the bottles before the caravan starts to rise. The bottles then, cannot be fixed to the caravan but need to be independently floating. Our devices do just that! The bottles are clamped to a floor plate or the calor box floor by a simple collar and screw system. The regulator is attached to a fixed plate. A separate square bar insert is pushed into a clamp bar, then fixed to the ground either by concreting or raw bolts (whichever is preferable). The gas bottles will now rise and fall with the tide, unable to float around the park causing possible damage to vans or to restrict the descent of the floating caravan.